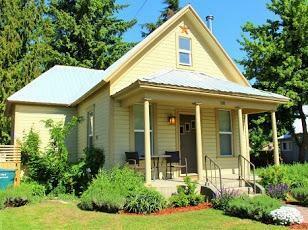 Very charming and historic house on a quiet street right in the heart of Leavenworth. Just a short walk to anything in town but a very private setting. Newly remodeled and ready for you to enjoy. Wood floors and an open living area with lots of natural light. Owner has lovingly updated this home and it shows. Nice covered front porch to enjoy the views from and a very private fenced back yard with gorgeous landscaping. Double car garage for parking and toy storage is a real bonus! This home would make a perfect full time residence or the ideal vacation home!